Popular historic sites such as Alcatraz Island and Twin Peaks are in your itinerary. Visiting Fishing Charters & Tours and Strawberry Hill will get you outdoors. There's much more to do: take a stroll through Fisherman's Wharf, identify plant and animal life at Don Edwards San Francisco Bay Wildlife Refuge, snap pictures at Golden Gate Bridge, and enjoy the sand and surf at Fort Funston National Park. To see maps, reviews, where to stay, and other tourist information, use the San Francisco trip itinerary planning site . The Route module shows you all the different ways you can get to San Francisco. In May, daytime highs in San Francisco are 69°F, while nighttime lows are 53°F. Finish up your sightseeing early on the 27th (Mon) so you can go by car to Yosemite National Park. 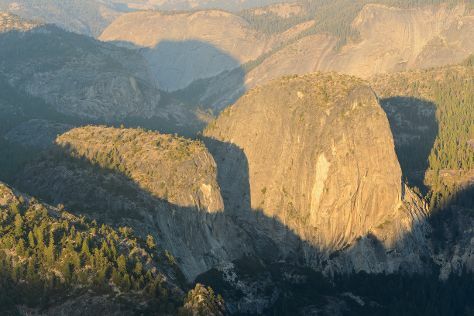 Kick off your visit on the 27th (Mon): take in the dramatic scenery at Yosemite Falls, take in the dramatic scenery at Vernal Fall, then take your sightseeing to a higher altitude at Cathedral Beach Picnic Area, and finally explore the striking landscape at Glacier Point. To see more things to do, photos, reviews, and more tourist information, use the Yosemite National Park visit planning site . Traveling by car from San Francisco to Yosemite National Park takes 4 hours. Alternatively, you can do a combination of flight and car; or do a combination of flight and bus. Plan for little chillier nights when traveling from San Francisco in May since evenings lows in Yosemite National Park dip to 34°F. Finish your sightseeing early on the 28th (Tue) to allow enough time to take a bus to Mammoth Lakes. Mammoth Lakes is a town in Mono County, California, the county's only incorporated community. On the 28th (Tue), contemplate the waterfront views at Convict Lake, then sample the tasty concoctions at Mammoth Brewing Company, and then contemplate the waterfront views at Lake Mary. To see more things to do, reviews, where to stay, and other tourist information, use the Mammoth Lakes driving holiday planner. Getting from Yosemite National Park to Mammoth Lakes by bus takes about 1.5 hours. In May, plan for daily highs up to 65°F, and evening lows to 34°F. Wrap up your sightseeing on the 29th (Wed) early enough to drive to Death Valley National Park. Start off your visit on the 29th (Wed): contemplate the long history of Harmony Borax Works, then cruise along Artists Dr, and then explore the striking landscape at Zabriskie Point. For more things to do, where to stay, traveler tips, and other tourist information, use the Death Valley National Park holiday tool . Drive from Mammoth Lakes to Death Valley National Park in 3.5 hours. Alternatively, you can do a combination of bus and car. Traveling from Mammoth Lakes in May, you will find days in Death Valley National Park are a bit warmer (83°F), and nights are much hotter (55°F). Finish your sightseeing early on the 29th (Wed) so you can drive to Bryce Canyon National Park. Kick off your visit on the 30th (Thu): stroll through Rim Trail, then identify plant and animal life at Bryce Amphitheatre, then look for gifts at Ruby's Inn Canyon Rock Shop, and finally trek along Navajo/Queens Garden Loop. To see traveler tips, other places to visit, photos, and more tourist information, use the Bryce Canyon National Park itinerary maker app . Drive from Death Valley National Park to Bryce Canyon National Park in 6.5 hours. Alternatively, you can do a combination of bus and car; or do a combination of bus, flight, and car. The time zone changes from Pacific Standard Time (PST) to Mountain Standard Time (MST), which is usually a 1 hour difference. Traveling from Death Valley National Park in May, things will get cooler in Bryce Canyon National Park: highs are around 63°F and lows about 31°F. Wrap up your sightseeing on the 31st (Fri) to allow time to drive to Zion National Park. Kick off your visit on the 31st (Fri): explore the wealth of natural beauty at Zion National Park. Inspirock's itinerary builder makes planning a Zion National Park trip simple and quick. You can drive from Bryce Canyon National Park to Zion National Park in 3 hours. Traveling from Bryce Canyon National Park in May, things will get somewhat warmer in Zion National Park: highs are around 76°F and lows about 41°F. Finish your sightseeing early on the 1st (Sat) to allow enough time to travel to Grand Canyon National Park. On the 1st (Sat), add some entertainment to your itinerary with Hopi House, trek along South Kaibab Trail, and then take in breathtaking views at Grand Canyon South Rim. Get ready for a full day of sightseeing on the next day: take some stellar pictures from Mather Point and then trek along Rim Trail. To see photos, traveler tips, other places to visit, and more tourist information, refer to the Grand Canyon National Park travel route planner . Use the Route module to find suitable travel options from Zion National Park to Grand Canyon National Park. Expect slightly colder temperatures when traveling from Zion National Park in June; daily highs in Grand Canyon National Park reach 85°F and lows reach 42°F. Finish up your sightseeing early on the 3rd (Mon) so you can go by car to Monument Valley. Monument Valley is a region of the Colorado Plateau characterized by a cluster of vast sandstone buttes, the largest reaching 1000ft above the valley floor. Start off your visit on the 3rd (Mon): trot along with a tour on horseback, then examine the collection at Goulding’s Trading Post Museum., and then don't miss a visit to Monument Valley Navajo Tribal Park. For photos, more things to do, reviews, and more tourist information, use the Monument Valley online trip itinerary planner . You can drive from Grand Canyon National Park to Monument Valley in 3.5 hours. Traveling from Grand Canyon National Park in June, plan for a bit warmer nights in Monument Valley, with lows around 54°F. Wrap up your sightseeing on the 4th (Tue) to allow time to drive to Arches National Park. Start off your visit on the 4th (Tue): explore the striking landscape at Fiery Furnace, explore the striking landscape at Delicate Arch, and then trek along Double Arch. To see maps, ratings, and other tourist information, read our Arches National Park day trip planning app . Traveling by car from Monument Valley to Arches National Park takes 4 hours. Traveling from Monument Valley in June, expect Arches National Park to be somewhat warmer, temps between 95°F and 61°F. Finish your sightseeing early on the 5th (Wed) so you can drive to Moab. On the 5th (Wed), skim along the rocks with a canyoning and rapelling tour and then take in the dramatic natural features at Island in the Sky. For traveler tips, more things to do, and more tourist information, you can read our Moab trip tool . You can drive from Arches National Park to Moab in an hour. In June, daily temperatures in Moab can reach 95°F, while at night they dip to 61°F. On the 6th (Thu), wrap the sightseeing up by early afternoon so you can travel to Lake Powell. Plan my trip to Lake Powell with suggested itineraries provided by Inspirock. Getting from Moab to Lake Powell by car takes about 9 hours. Traveling from Moab in June, you can expect nighttime temperatures to be somewhat warmer in Lake Powell, with lows of 69°F. On the 8th (Sat), you're off tohome.